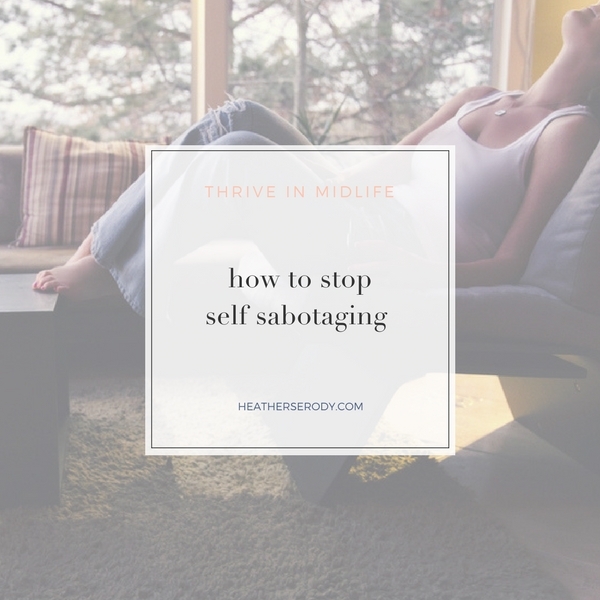 Do you self-sabotage? Missing workouts. Sabotaging your diet. Picking fights. The best news is that you come equipped with the most powerful tool in the universe to be able to change how you feel about this issue of self-sabotage or feeling stuck-your own mind. I'm going to push you to think about this from another perspective. Hang with me. There is a circumstance that makes you unhappy. It can be anything – overweight, bad boyfriend, annoying mother-in-law, etc. Since the circumstance is proximal or close to our distress or unhappiness, we try to change the circumstance, with our own behavior or change the behavior of others in order to feel happy again. It sounds logical, but it's just not true because correlation does not prove causation. Think if the money-obsessed millionaire who realizes that money doesn't actually make her happy, or the athlete finally runs that fast marathon time and realizes she's no happier than before. Miserable lottery Powerball winners can teach us so much about how we believe things outside our own thinking will make us happy. It's impossible to fix or change things that are ultimately out of your control. There is nothing that you can do that will guarantee the changes you want to see in others or the circumstances of your life. When you persist in trying to change anyone or anything other than yourself you are not acknowledging that the way that we find and create and sustain happiness for ourselves is in our mind. Just a few days ago I received an angry text from a lifelong friend. It was awful. Her friend told her that I had said terrible things about her to another friend. I told my friend that it wasn't true. Guess what? She doesn't believe me. Why? Because the thoughts that she is choosing to think about me agree with this nasty bit of gossip. She is allowing this false gossip (circumstance) to dictate how she feels about me, but the hard truth is that if she wanted to believe the best about me, she could. The thoughts she is choosing to think about me is in agreement with the lies she was told. Our brains reward us when our realities match our thinking and repay us in the form of feelings of righteousness. When I saw this drama through the lens of faulty thinking I came to the conclusion that there is nothing to be done. Hypothetically, if I allowed this ‘circumstance' to dictate how I feel (potentially angry, attacked, hopeless, and frustrated) then I'd be going down the road of self-sabotage, which is a perfect example of what we are talking about here. I didn't say that learning how to not feel stuck or not self-sabotage was easy. Never argue with what is. In this case, if my friend doesn't want to believe me, I have to allow it in order to remain free of this negative circumstance. The only thing that I can actively do to remedy the situation is to choose to deliberately think thoughts about this negative circumstance that makes me feel better, more empowered, and not fighting what is. Ultimately I choose to love her even though she chooses not to trust me and there is nothing she can do about that. 😉 Ha! I've learned that allowing negativity is very different from fighting negativity. One will make you stronger and the other one will tear you apart. Am I arguing with what is? Am I trying to change anyone or anything outside of myself? What thoughts am I thinking in response to this person or situation? What thoughts can I choose to think instead that don't argue with reality and also make me feel better/more peaceful/loving/accepting? Apply the fix of deliberate thinking as the ultimate cause of how you feel about all aspects of your life and I'm sure you'll be amazed at how your perspective changes. You'll take more responsibility for your feelings, put less blame on others, and be able to shift how you think about your life. I offer one on one phone coaching to help teach you how to coach yourself or apply the self-coaching method to work on a particular issue.